With Readly you can read All About History Book Of The Roman Empire and thousands of other magazines on your tablet and smartphone. Get access to all with just one subscription. New releases and back issues – all included. It is the legendary empire that inspired some of the most celebrated art and literature of all time and is cited as the start of modern civilisation. The Roman Empire was a political and military force to be reckoned with, and their influence spread far across Europe and the Mediterranean. Remnants of their civilisation and infrastructure still exist today, reflecting the lasting nature of their legacy. 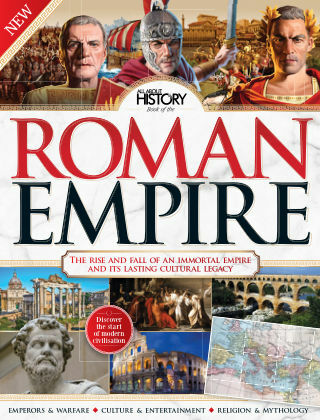 The Book of the Roman Empire takes a closer look at the famous Ancient Rome, from its icons like Caesar and Julia Maesa to its mythology and religious practises.Featuring: Roman life and society - What was life like for the Romans, how did they keep themselves entertained, and how did the class system work? Roman icons and emperors - From Caesar to Cicero, learn how the most famous and iconic leaders in Ancient Rome made their mark. Religion and mythology - Meet the gods of the Roman pantheon and discover their heritage, and find out how the Roman chose to worship them. Rome’s military prowess - Trace how the Romans battled and conquered their way to greatness.